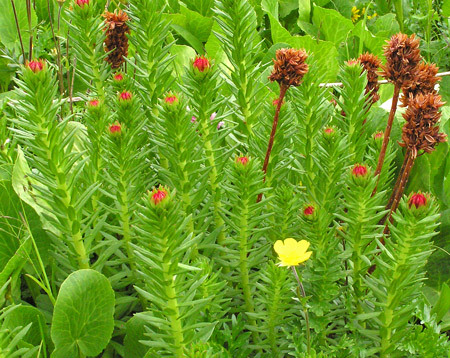 Linnaeus named both the Sedum and Rhodiola genera in 1753. "Sedum" is from the Latin "sedo", "to sit," and refers to the fact that some Sedum species attach themselves to stone. 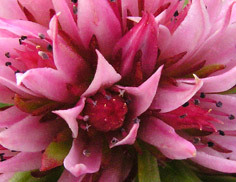 "Rhodiola" is Greek for "rose-like". 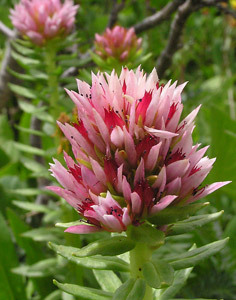 Rhodiola rhodantha. Synonyms: Clementsia rhodantha, Sedum rhodanthum. (Queen's Crown, Rose Crown, Rose Root). Subalpine, alpine. 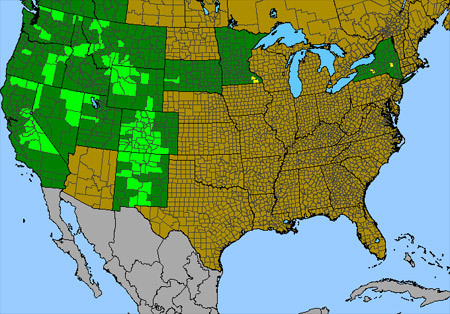 Meadows, tundra, wetlands. Summer. Left: Lake Hope Trail, August 11, 2014. Rose Crown and King’s Crown are quite similar, having short succulent leaves on a thick, straight 8-13" stem topped by flower clusters. Both enjoy being in wet meadows, but King's Crown will often also be found in drier open woods and Rose Crown will commonly be found in quite wet high mountain meadows. Rose Crown’s flower cluster is a rounded column. King’s Crown’s flower cluster is a flattened pancake. Color is an even more distinguishing feature: Rose Crown is deep to very light rose; King’s Crown is maroon to almost iridescent black/red. Most often Rose Crown is found scattered in small clusters whereas King’s Crown often grows in thick patches making its flowers even more vivid and noticeable. 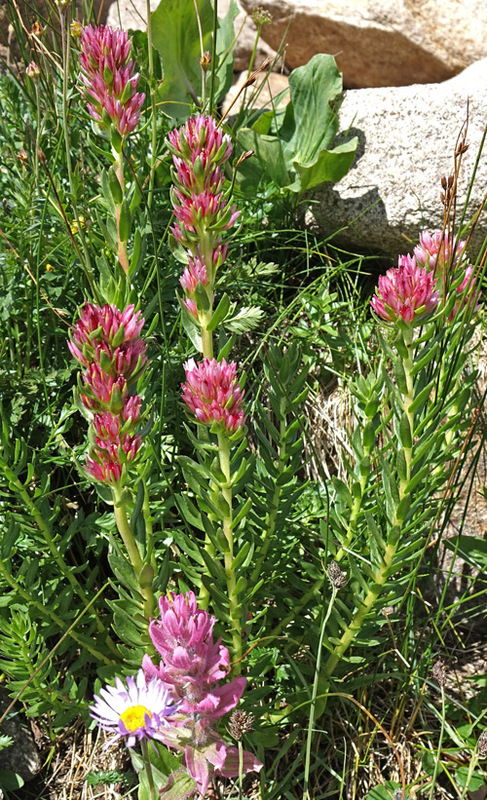 Rose Crown is less common in the Four Corners mountains than King's Crown, but click to see that it is common at its favorite altitudes and in its favorite wetlands. Click for more Rose Crown. 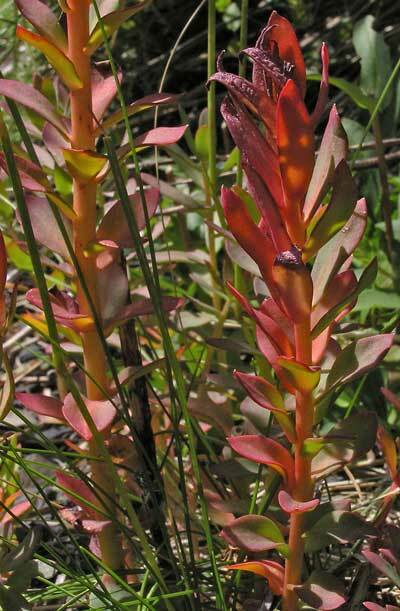 Rhodiola rhodantha flower stalks dry to a cinnamon brown. 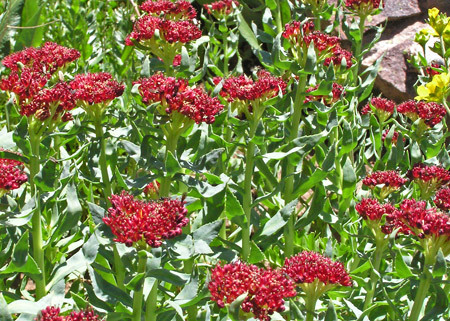 Rhodiola rhodantha was first collected for science by Charles Parry in Colorado in 1861 and was named Sedum rhodanthum by Asa Gray in 1862, Joseph Rose renamed the plant Clementsia rhodantha in 1903, and H. Jacobsen gave the presently accepted Rhodiola rhodantha in 1973. Subalpine, alpine. Meadows, tundra. Summer. Sharkstooth Trail, July 18, 2005. Owens Basin Trail, June 13, 2004. 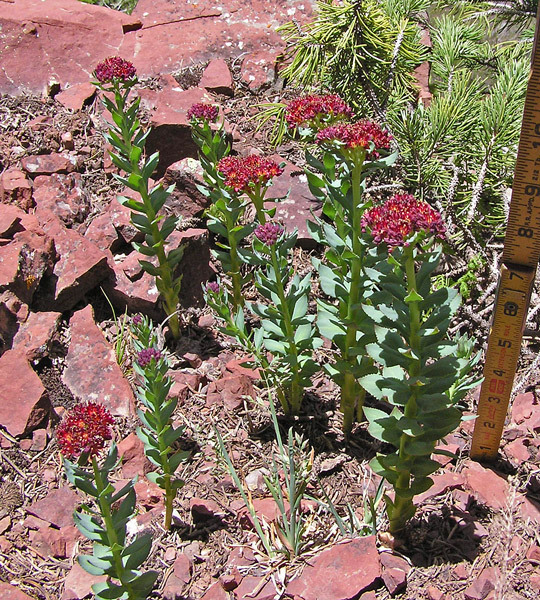 The photograph above of Rhodiola integrifolia was taken in a moist meadow; the one at left was taken on a dry, rocky ledge. 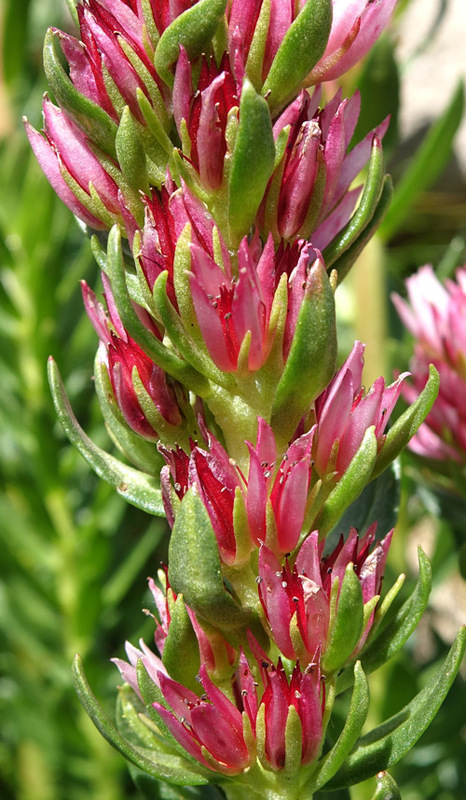 This species was first named Rhodiola rosea by Linnaeus in 1753, was renamed by Antonio Scopoli in 1772 to Sedum roseum, and was given its presently accepted name of Rhodiola integrifolia by Constantine Rafinesque in 1832. "Integrifolia" is Greek for "complete foliage", perhaps meaning "entire", i.e., smooth-margined. 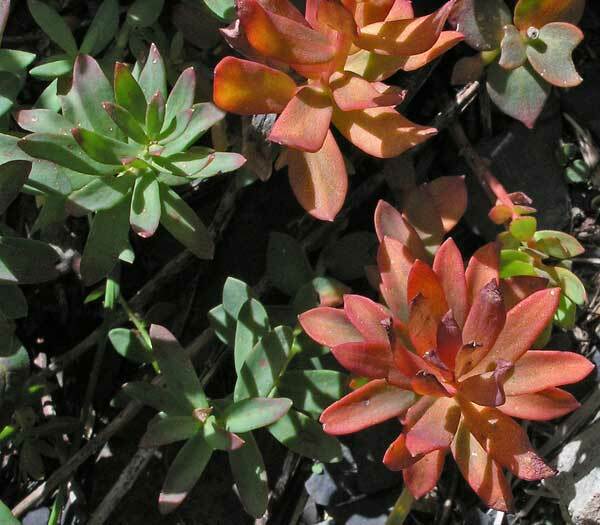 Most authorities now place both species shown on this page in Rhodiola. El Diente Trail, August 29, 2005. Both King’s Crown and Rose Crown turn lovely shades of orange/red/yellow/green in the fall.